Happy New Year! Quite a bit of snow fell during December. 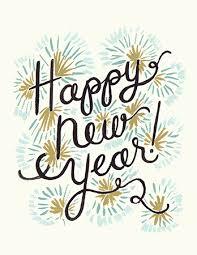 Sending everyone New Year greetings, whether Gregorian or Asian! It’s been a wild few months of fall 2016, having gone through the process of sorting, packing, and moving my belongings from my beloved home of 18 years; also, the source of all my previous postings for High Vibe Bounty. It was a prolonged process I wouldn’t care to repeat very soon. Hard to believe the planning started in June, but not a lot could be done without any storage units available in this college town, until classes started in late September. I could only pack so many boxes, before being stuck with no place to put them. That led to a bit of stall in being able to show my place for rental purposes, but it all came together relatively easily; it just seemed to be a never-ending process to get through the needed repairs and improvements. Naturally, I said my good-byes to the yard, and harvested the CG bounty for the last time. I think neighbors were feeling little incentive to harvest, knowing I would be leaving, but I did put out a request for help in weeding and removing the last of the tomatoes! Deer netting is still up for protect any weeds that are enjoying our winter…lol. What my renter decides to do with that space is her choice! Meanwhile, I have a new home and new roommate, who won over my heart (and apparently vice-versa). 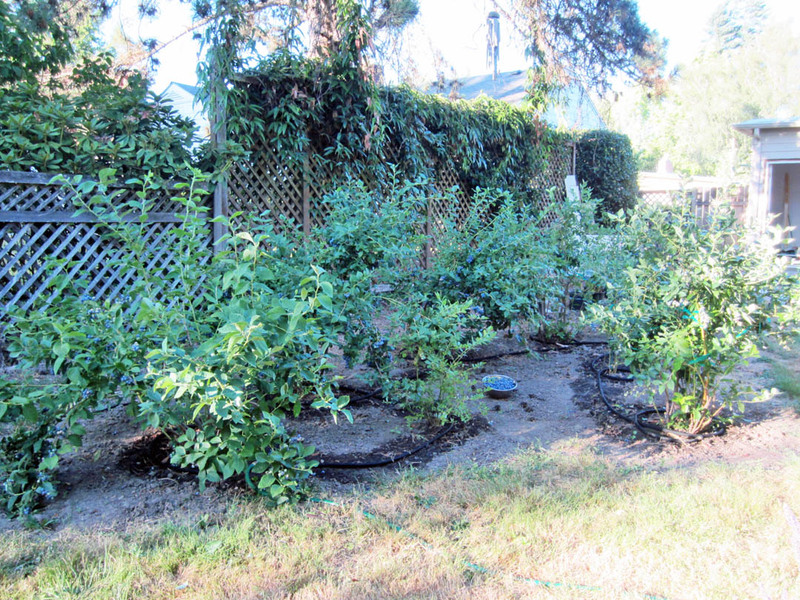 I may have mentioned earlier that his yard is a more challenging scenario, given some years of neglect (not his priority or forte), but I have been rehabilitatinging his old blueberry bushes for 3 years, and they are doing great. This year will require more thought on how much old wood to actually leave, now that many younger stems have filled in my previous thinnings. It might mean a temporary decrease in fruit this year, but we’re still stuffed to the freezer limits with last year’s stash! 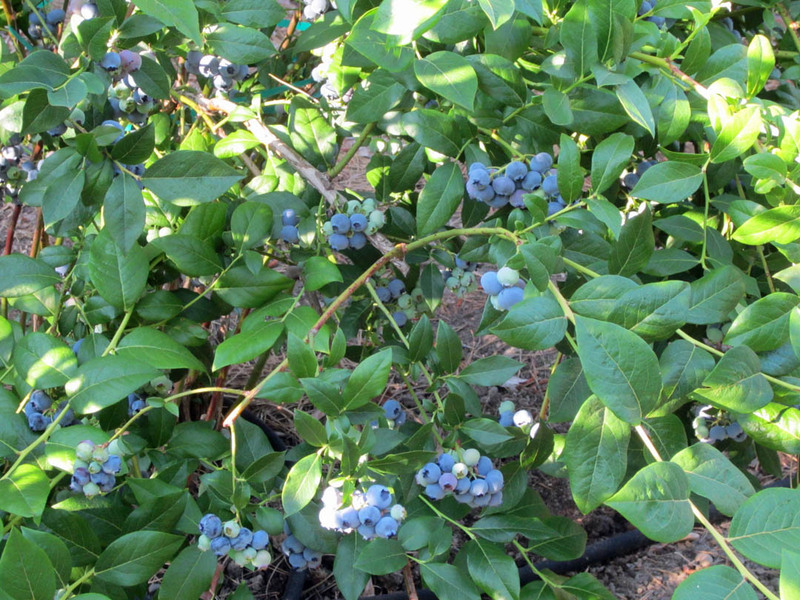 Blueberries biding their time through rain and snow! That irksome jack-in-pulpit ground cover thought our warm fall was just prime for re-emergence before winter, and wasn’t phased by any snow! 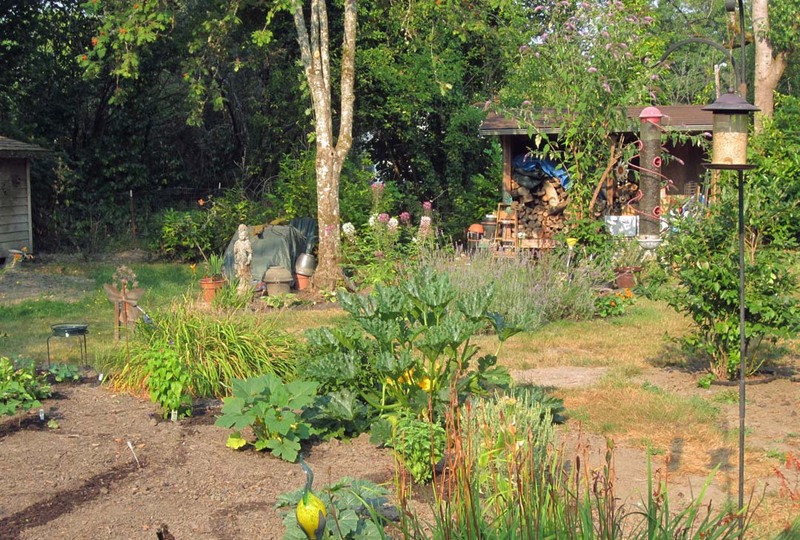 Unlike my own property project, which was essentially a clean slate of lawn that could be covered over and established as I liked, my new yard is overwhelmed with ancient shrubs, overgrown with English Ivy from neighbors’ yards, and a plethora of weeds/lawn. 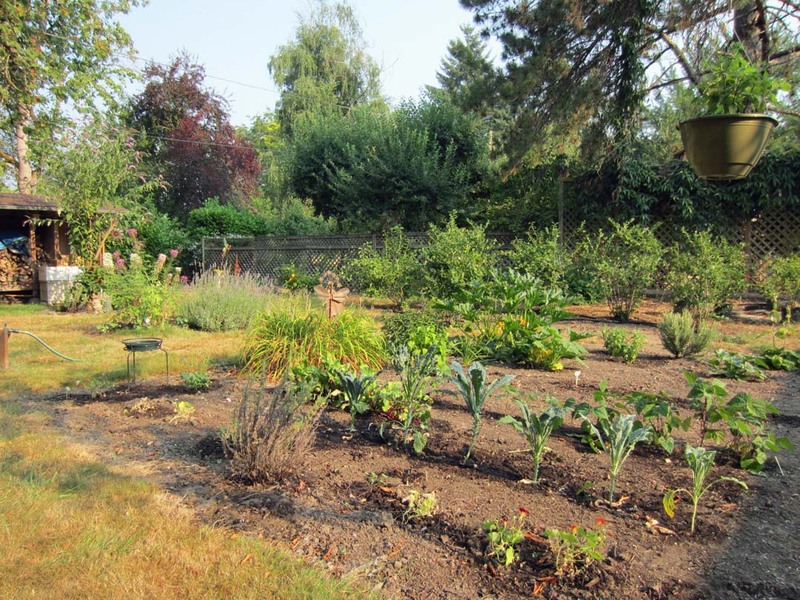 There is a nice patch of area for putting in a veggie garden, yet it does not produce as prolifically as mine did, given clayier soil, more shade from gigantic trees on south and west property lines, a the house itself on its sunny eastern side. Last summer we removed two giant sweetgum trees that had become a nuisance to the house foundation, so there is more eastern light in the morning, which is great inside the house, and for the newly planted landscape mounds in front of the house. Giant sweetgum no more, making way for more sun, and a new perennials bed project out of the ground stumps/earth, thereby letting me move a few favorites from my yard. Deer proof/resistant necessary on the open street size. Randall showing his new expertise, gardening and computer-tasking, both at the same time…not! 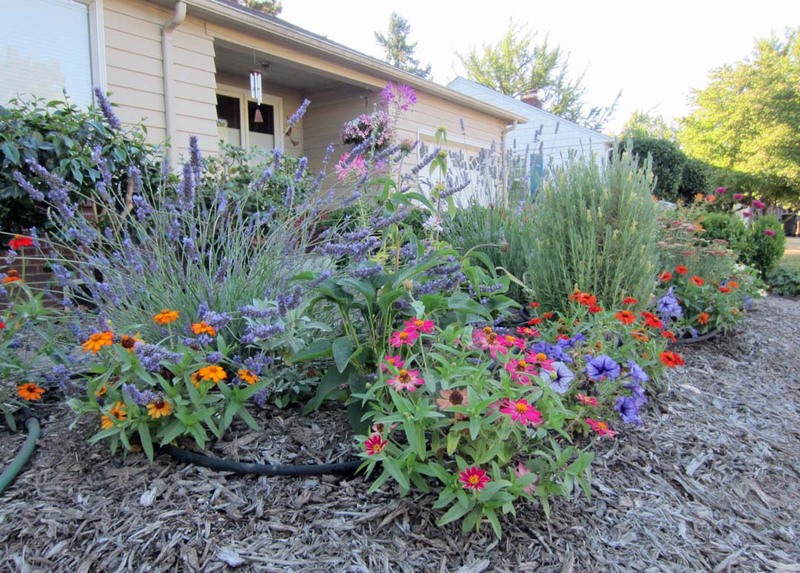 Pleased with a new front yard that should be relatively drought tolerant in a couple of years. 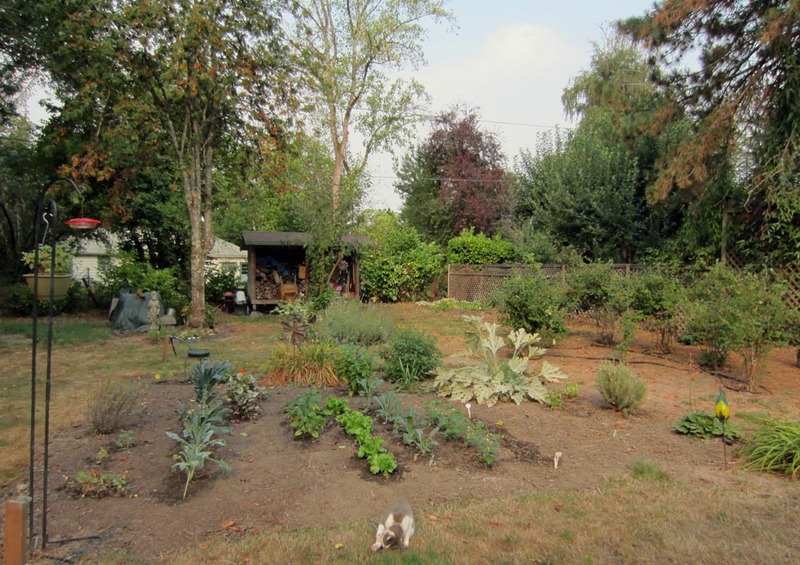 The concept of “sharing the bounty as a community garden” is now not the priority topic at my new home, since we have no community garden out front here; it’s all in the large BACK yard. Still, this will be a project of continuing the high vibes of gardening with both food and flowers. It’s a big area to redevelop, especially when the left side floods! Kwan Yin keeping an eye on things from her temporary abode. Like all those planters? Uprooted, and moved from various places, mostly my old yard. But, where to put them? 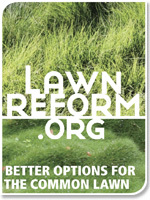 One of the dilemmas of how to salvage this backyard space is how much time, effort, and money, we want to actually invest in this, since we need professional help to remove and restore things. We attempted to control the invasive ivy and jack-in-the-pulpit ourselves last summer,using mechanical and chemical means (in order to stay sane), but it hasn’t apparently had much effect, at least on the “pulpit” invaders. And they love root disturbance, just as do blackberries (a few of those as well). 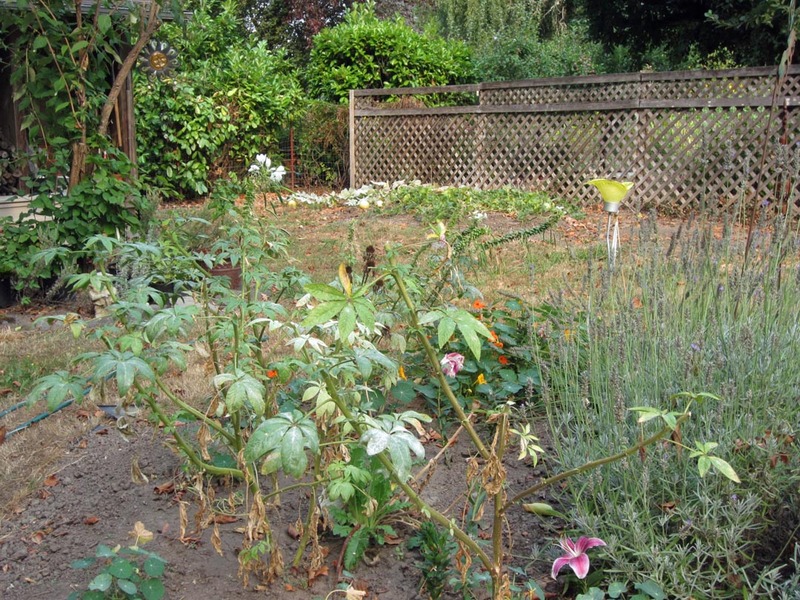 I can compromise with patches of weeds in proper places, but I have little tolerance for them around edible plants, so there’s a considerable amount eradication needed. 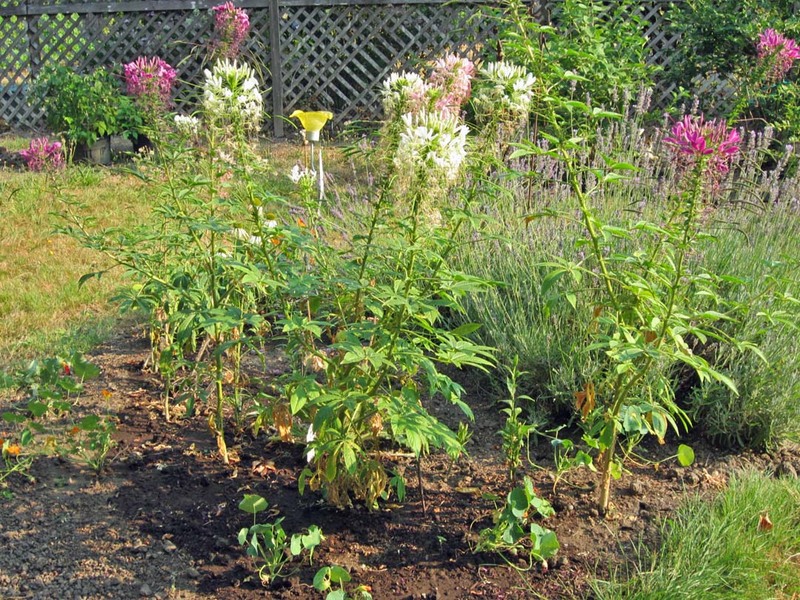 And, with neighboring rentals that aren’t really interested in maintaining weeds, there is always a source for re-invasion, hence continual vigilance and maintenance (though that in itself is nothing new for any garden). And, in the long run, how long will we stay here? The neighborhood, so close to campus, is prone to noisy parties and more problems that don’t delight my sense of security. We already had a nice teak removed from the front porch while on vacation in December, even with someone coming to the house twice daily to feed Juni and Aspen. Still, we will expand the veggie planting area, and hope for more successful tomatoes and squash this year. Aarg! Jack-pulpit, blackberries, ivy, and holly bushes make this garden maintenance a challenge in the long run. I do love that the backyard is essentially deer-proof! There are a few that have been spotted on occasion, but they tend to stay in neighborhoods 5 blocks away, where they have more front yard options to browse. I have found one in a nearby yard, but he couldn’t get into ours. And with so many large old trees surrounding us, there is a consistently larger diversity of birds: flickers, woodpeckers, chickadees, juncos, red finches, goldfinches, bushtits, nuthatches, western tanagers, scrub jays, and the obligatory always-quarreling starlings and crows, who raucously knock the suet feeders off the hooks. A grey squirrel comes many days to pick up discards under the sunflower seed feeder. It is quite the menagerie to watch on a given day, viewed from the kitchen window. Our hummingbird feeder just under the front porch eave is visited by a female and a couple of males, with no more than 20 minutes’ absence between them on their rotations. Life is good! Keeping Anna’s hummers fed and zippy! Beautiful male Monarch on my Asclepias! The spot, circled in yellow, is mirror-imaged on the other wing, and indicates this to be a male. Photo courtesy of neighbor, Jamie Simmons, who also watched this specimen flitting in his yard. We’ve been blessed with the presence of an authentic Monarch butterfly in the garden this last week, following my sighting of 3 more out in some pasture lands on the outskirts of town. The Monarch is a relatively rare butterfly to see in this area, and I can’t remember the last time I saw one: with the overall decline in their populations over the last decade, I was surprised and delighted to see these, especially in a short amount of time! Almost didn’t trust my eyes! I grew up with them as very commonplace yard visitors, and missed their numbers up here in western Oregon. Even though I’ve grown a type of milkweed for many years (a non-invasive cultivar), it hasn’t hosted very many caterpillars in its lifetime, nor is it the favorite of the monarch. However, more people are planting various types of milkweed in the area, and perhaps it is paying off. He is not always present on a daily basis, but one afternoon and evening he was a visitor for several hours, flitting about, around to neighbors, and back, and alighting on the butterfly bush, which is loves for nectar. The frequently visiting Swallowtail was also cruising through the yard, and there were some near collisions at the Buddleia bush. Jujubes have shown up, too, jumping and whirling themselves about in little frenzies, which didn’t phase Mr. Monarch. Such a delight and blessing to see them all active and energetic. I did have to remind little Juni-cat that she should not even think about trying to capture our visitor! She has caught a Swallowtail before…grrr. Our first bounty of beautiful yellow crookneck squash was picked a couple of weeks ago, and a ripening tomato can be seen from certain viewpoints in the yard. However, most of the tomatoes are green; our intermittent pattern of 3-days cooler than average, then 3 days normal summer heat, is not conducive to speedy tomato ripening. There might be green tomatoes at season’s end this year, depending. Spaghetti squash is being true to form and pumping out its fruit, (with bees’ help, of course), and at last count last weekend, I saw about twelve softball-sized squash. Five days later, some of them are now almost full-grown for this variety, like a good-sized canteloupe. We’ve had very, very, very, very bad deer this year, in spite of extra netting. They have learned to walk on netting and bite through it for their highly-desired bean leaf sprouts, and then they won’t leave them alone. There will be absolutely no bean harvest this year; I leave the stems to torment them! Always one day (no, one night!) ahead of me, they demolished over half the lettuce crop. It appears we might get some lettuce re-growing though as summer cools off a bit. And they harass some of the melon and cucumber seedlings, too, when least expected, so we’ll see how those do. Tomatoes are protected enough now that they can’t do too much damage. Early July deer damage. Forget any bean harvest this season, and only a bit of lettuce escaped sabatoge. The day after this photo shot, they munched the rest of the lettuce, and proceed to keep it mowed. That’s what happens when you leave town for a few days…all of a sudden it is a massive crookneck jungle! May have to do some disciplining/removal so the hidden melon plant can see more sun! Spaghetti squash interloping with tomatoes. At least deer don’t like the prickly leaves at this point. Squash fruits galore, running all over the place. …rather than tulips. Perhaps slogging is a better term; definitely rubber boots weather! Thank goodness for an assortment of blooming tulips and daffodiles to welcome the onset of Spring in western Oregon, which greeted us with more strong rains. Tulips to the rescue to welcome Spring, while puddles prevail! Three days of no rain let the previous puddles drain away, and provided us with a chance to dash into the garden to do more pruning, throw on some fertilizers, weed, and minor transplanting. Even a hike into the forest as we felt an energizing rise in temperature. Equinox today bestows us with more puddles. It has been a day for inside work, cleaning and refilling the bird feeders, reading, cooking, and contemplating future strategy for garden projects (like re-establishing medicinal plants I used to have). Kind of a “retro-spring” in my mind; reminiscent of winter/springs a couple of decades ago, before the warmer, drier shifts of the last few years. In that sense many of us locals don’t mind “global warming”. Not even thinking about the CG yet! But weeds are easy to pull! Welcoming more noticeable light to our northern hemisphere days, while knowing it is harvest-season in the southern hemisphere! May we/you be bountiful in all areas! Hyacinths and primroses deal with all four seasons of spring weather!